OUR PRICE: $119.84 - Join Rewards Get $11 Dance Dollars On This Item! The innovative Stretch Series collection offers high-performance footwear with one-a-kind stretch satin that contours to the foot and creates a beautiful line like no other. The "Synthesis" shoe features a full grain leather split sole with maximum durability, high-quality stretch satin upper with super comfortable stretch lining, graduated toe box with internal cushion that offers noise reduction and comfort, and an extremely flat platform for utmost stability and balance in all directions. 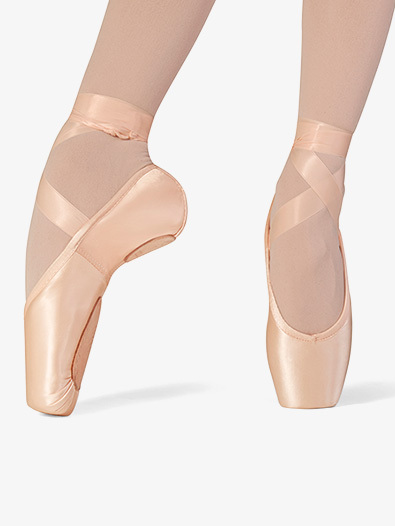 Shoe also features Bloch's revolutionary "Relevease" insole that uses biomimicry technology to provide full support while going from demi to on pointe. Ribbons and elastic not included.